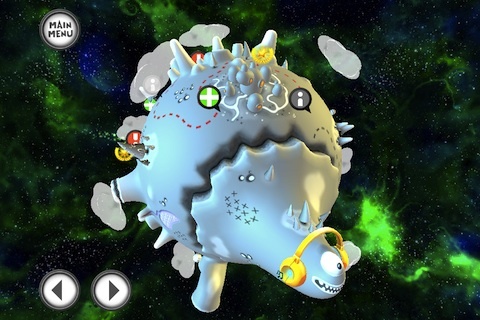 Jelly Defense is a new tower defense game for iPhone and iPad that was released on Thursday, September 29, 2011. Infinite Dreams surely has a hit on its hands, if Jelly Defense goes over as well as it did with my five finicky gamer sons this weekend. Not only did the iPhone app receive unanimous glowing reviews by the boys, but as a parent, it is an appropriate game for your gamer kids. Jelly Defense is one of those great games where it’s interesting and fun for all, and it’s a pretty cool thing to bond with your kids over an iPhone app. The trailer for Jelly Defense really does not do the game justice. And, honestly, the story of jelly versus evil does not make the game unique. Any tower defense game has opponents battling for the win. In fact, the trailer initially made it more difficult for me to get my boys to try the game. They were, despite their initial reluctance, hooked from the beginning. The tutorial is clean, concise, and effective. The movement is easily controlled with agile, clearly defined, and responsive finger taps and swipes on the screen. Even if you don’t take time to check out the tutorial, you’ll easily pick up the game. You may just progress more slowly until you understand the function of each component, how to maximize your point total, and increase your inventory. 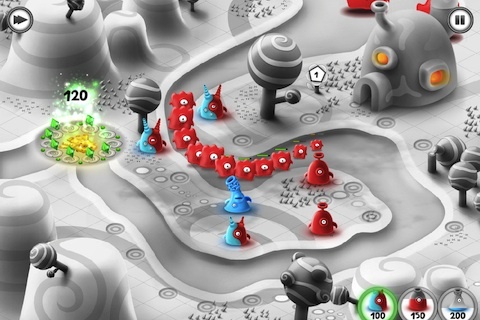 The art style is definitely unique and helps to set this tower defense game apart from its competition. The graphics have an unexpected, sophisticated cartoon vibe. For example, you access the game through a monster-headed planet wearing headphones that reminded me of Super Mario World. The game has a spirit and sense of humor that emanates through the bright, contrasting graphics and the super cool music. I am frequently plagued by earworms from some hideous gaming music, and after three days, this music snob still likes the music. It has a cheeky, upbeat rhythm with lyrics in what I assume to be the jelly language. Infinite Dreams has created a fun and intuitive iPhone and iPad app through its attention to the right mix of details—great graphics, precise control, and cool game atmosphere. And, with 22 levels, the game has a depth and challenge that will continue to draw you back into the Jelly Defense world. There is currently a Facebook and Twitter campaign to bring the price down to 99 cents at release, instead of $9.99. Regardless of the outcome, our clan will have no problem paying $9.99 for this game. I look forward to Thursday when my sons can purchase the Jelly Defense iPhone and iPad app. I think that’s the only way to get my iPhone back. Update: Jelly Defense is out. Infinite Dreams has set the launch price at $0.99 and as a special incentive their other games Jelly Invaders and Jelly Chronicles are free for a limited time. Jelly Defense is also available for $0.99 in the Android Market and in the Mac App Store. AppSafari review of Jelly Defense was written by Jenni Ward on September 29th, 2011 and categorized under App Store, Featured, Games, Puzzler, Strategy, Tower Defense. Page viewed 5065 times, 3 so far today. Need help on using these apps? Please read the Help Page.